Chef Steve Zimei is the Executive Chef at Chopps American Bar & Grill, which is located at the Marriott Burlington. Steve is a native of Massachusetts and graduated from Johnson & Wales University in 1995. He then began his culinary career working for Chef Daniel Bruce, eventually becoming a sous chef at Rowes Wharf Sea Grille. Steve would also work on the opening teams for spots including Aquitaine, Harvest and XV Beacon Hotel. 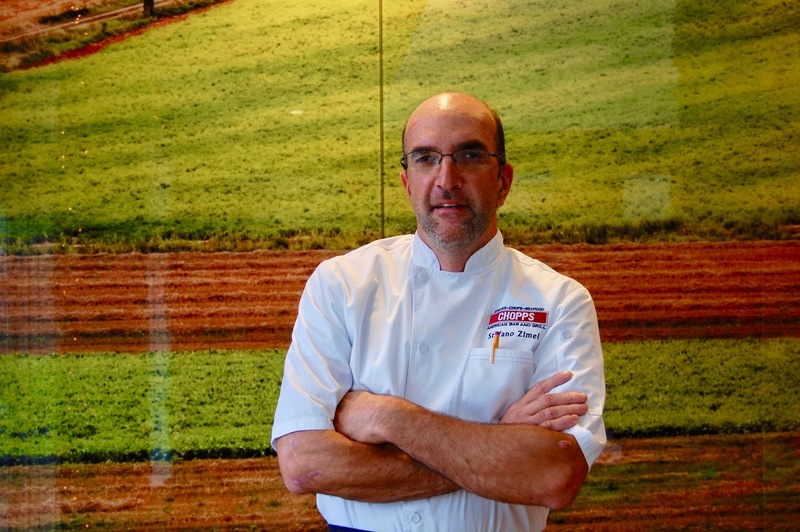 In addition, Steve moved onto executive chef positions at places including Gallia, Hotel MIT, The Worcester Restaurant Group, the Papa Razzi Group, and most recently Trails End Café in Concord. Most recently, Steve returned to work with Chef Bruce at Chopps, introducing new flavors to rejuvenate the American chophouse. Outside of the kitchen you can find Zimei, an avid runner and cyclist, racing for the local cycling team Optimum Performance and serving his community through various charitable organizations. Zimei currently resides in Leominster with his wife and three young sons. Chopps American Bar & Grill is one of my Top 50 Restaurants of 2017, and I've enjoyed numerous lunches and dinners at this spot. Chef Zimei is helping to ensure the consistent quality of this restaurant and it's great to see the new dishes he creates. "Culinary Creativity plays a vital role in being a chef. I am constantly thinking of what's coming in-season and new ways for my staff to learn and grow as culinary professionals. Being creative with menu design, technique, and presentation are all essential in this industry. The best part of my day is when I see a dish come to life. We have a vast array of clientele from all over the world that dine with us at Chopps, so we like to showcase our talents with weekly features that, if a fan-favorite, have the potential of going on our menu." "I find that a lot of my inspiration stems from visiting local farms where I can feel, eat, and smell the freshest produce at the time. I like to utilize new ingredients to compliment dishes. Traveling to other restaurants to try different cuisines is also important to me to stay current in the culinary world. Not only is it fun, but experiencing new dishes really helps with flavor combinations that I can use to develop into my own style." "A lot of my menu items develop from foods that I love to eat...I often go out and have dinner and say, “man I need to have a variation of this on the menu.” I will then experiment with flavors that are true to my style and build from there. Often seeking advice from my sous chefs is the best way to get a true feeling of whether the dish works or how to tweak it if needs be." "Creating a dish for me always starts by using the highest quality of ingredients that is in-season. We change our menu quarterly, so a menu change isn't just a few items but 10-15 dishes. I typically focus in on an idea and then run it as a feature on a tasting menu. Eating a dish a few times helps me navigate textures and flavor profiles until it is at the standard we want to serve guests. With the chef’s tasting menus, we can really play around with off-menu items and those tend to be the most fun for us!" "My sous chef and I are constantly bouncing ideas off each other. Most times, we will bring ingredients into the kitchen and cook until we are happy with the end result. This is a time when we can be totally honest and also allow for our staff to give feedback." "The hardest part of culinary creativity is not letting yourself fall back into your "old stand bys". I try to not repeat dishes that I have crafted in the past and continue using different products. Staying focused when in the restaurant is a different challenge in itself when so many things are happening simultaneously." "Absolutely. I don’t usually tend to have writer’s block in terms of creativity, but I often overthink dishes, which can prevent me from letting the simplicity of natural flavors shine. To overcome this, I take a step back from my pad, and go for a long bike ride to clear my head. I’ve also found it’s helpful for me to think of food pairings late at night before I head to bed…when the kids are asleep and the house is quiet. Usually this is when I’m not stressing over why I just put watermelon and sea beans together!" January 1, 2018: I chose to open two bottles of Crémant d'Alsace as a delicious way to start the New Year. My first wines of 2018, paired with 12 pounds of Homarus americanus, the American Lobster. Bubbles and the Bounty of the waters of Maine. Simply put, Crémant d'Alsace is a French sparkling wine from the Alsace region. In Alsace, they have been producing sparkling wines since the early 19th century but it wasn't until 1976 that the Crémant d'Alsace AOC was created. It's produced in a similar fashion to Champagne, though there are some differences as well. The term "crémant" means "creamy" and originally referred to sparkling wines that were produced with less pressure, which tended to make them taste more creamy than effervescent. The Crémant d'Alsace AOC has strict regulations on viticulture and viniculture, and six grapes are permitted including Pinot Blanc, Riesling, Pinot Gris, Auxerrois Blanc, Chardonnay, and Pinot Noir. Most of their Blanc de Blancs is made from Pinot Blanc while Pinot Noir is the only grape permitted in their Rosé. Total production of Crémant d'Alsace, which comprises about 22% of the region's production, is about 33 million bottles. However, only about 300,000 bottles are imported into the U.S.
Americans need to drink more Crémant d'Alsace! In fact, Americans need to drink more wines, of all types, from Alsace. As I've said repeatedly before, the wines of Alsace are generally not on the radar of the average consumer but they should be. They can often provide excellent value and taste. They are enjoyable while young but can also age well. They can provide a sense of history, as well as showcase state of the art wine making. They pair well with a diverse variety of foods and cuisines. And at their most basic, they are absolutely delicious. To learn more about Crémant d'Alsace, check out some of my previous articles where I share my passion for this tasty bubbly, including: Crémant d'Alsace & The Spartans At Thermopylae, Schoenheitz Winery: A Taste Of Beauty, Puritan & Co.: Alsatian Wine Advice, Gustave Lorentz: More Alsatian Wine Treasures, Alsatian Wines & Pheasant at Craigie On Main and Crémant d'Alsace: A New Year's Eve Recommendation. The first of the wines for the evening was the 2014 Domaine Albert Mann Extra Brut Crémant d'Alsace (about $24). The winery is a union of two families, Mann (who have been wine growers since the start of the 17th century) and Barhelmé (wine growers since 1654). Currently, the winery is owned and operated by Maurice and Jacky Barthelmé, with their wives, Marie-Claire and Marie-Thérèse. The Barthelmés believe: "The goal of the estate is to produce wine that is in harmony with nature. Wine is the memory of the grape and is capable of transmitting the taste of the earth." In adherence to this belief, their estate is certified organic and has been Biodynamic since 1997. Their estate includes 23 hectares of vineyards, broken up into about 100 separate plots, growing Riesling (29%), Gewurztraminer (20%), Pinot Blanc/Auxerrois (19%), Pinot Gris (17%), Pinot Noir (11%) and Muscat (3%). This Crémant d'Alsace is a blend of Auxerrois, Pinot Blanc and Pinot Noir. With a fine golden color and a myriad of tiny bubbles, it possesses an alluring aroma, with elements of fresh fruit. On the palate, the Crémant is fresh, crisp and dry, with delicious flavors of green apple, pear and hints of lemon. Though it is fruit driven, there is complexity in the palate as well, with a touch of minerality and hints of spice. There is a light, elegant creaminess to this wine with a lengthy, pleasing finish, ending with more fruit notes. It livened up my mouth and brought to mind the coming Spring. It was my favorite of the two Crémants and at this price point is an excellent value. The second wine of the evening was the NV Meyer-Fonne Crémant d'Alsace Brut Extra (about $24). The winery is currently owned and operated by Félix Meyer, the third generation in his family since his grandfather founded the domaine in the late 19th century. The vineyards comprise about 12 hectares, over seven communes, each bringing its own unique terroir. Though the winery has been modernized, Félix still follows some traditions, such as aging wines on the lees in large, older foudres, and has a strong respect for terroir. This Crémant d'Alsace is a blend of 60% Pinot Auxerrois, 20% Chardonnay, 15% Pinot Blanc, and 5% Pinot Noir. Many of those grapes are sourced from vines that are about 45 years old. The lees rest in the bottle for a minimum of 12 months before disgorgement. It's color is a bit paler gold than the Mann but has equally as fine bubbles. Its aroma is more subtle, with mild fruit and a hint of brioche. On the palate, this Crémant is fresh, crisp and dry, with more savory notes, underlying apple and citrus notes as well as a backbone of minerality. There is a touch of bitterness on the palate too, which isn't off-putting, and adds complexity to the taste. The ending is long and satisfying and is also a good value at this price point. Though I preferred the Mann of the two, I still enjoyed this wine and it is worthy of my recommendation too. How did the Crémant d'Alsace pair with our lobster dinner? In general, Sparkling wine is a versatile food wine and often pairs very well with seafood. 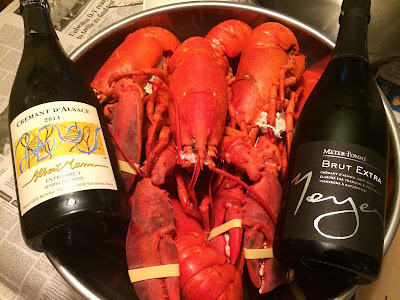 With the sweetness and rich of lobster, especially dipped in drawn butter, it helps to have a wine with good acidity and both of these wines possessed that trait. Plus, their tiny bubbles helped to cleanse the palate between bites. The complex flavors of the two wines also complemented the delicious lobster. It was a killer pairing, well appreciated by everyone at the table. And such a hedonistic way to begin the New Year. With Valentine's Day coming, I'd highly recommend you emulate my dinner, and share some lobsters with your significant other, pairing it with some tasty Crémant d'Alsace. Or just drink some Crémant d'Alsace for another special occasion. Or just drink it because it is a Tuesday or Wednesday night. Which local restaurant critics, reviewers, bloggers and others are the most influential? That is a difficult question to answer and some believe it is based, at least in part, on their number of social media followers. However, a recent New York Times article, The Follower Factory, has ignited discussions about fake followers on various social media platforms. People can purchase fake followers, to increase their numbers so that they seem more popular and influential. For some "influencers," the number of their followers directly affects how much money they generate, so there is a clear incentive to raise their follower numbers, even if they must buy them. As such, followers numbers may not be a good measure of influence. Before dining out, many consumers consult restaurant reviews to assist in determining where they should eat. They may read newspapers, magazines, blogs, message boards, and social media sites. Sometimes they'll read multiple reviews of a restaurant, while other times a single review will catch their eye. Based on what they find, they may select a certain restaurant, finding a compelling reason in the review they checked out. Unfortunately, many of these diners fail to mention to any of the restaurant employees the reason for why they chose to dine there. They eat in silence, remaining anonymous, and no one realizes what drew that customer to that particular spot. As such, restaurants don't understand the full extent and influence of specific restaurant reviews. A large piece of the overall puzzle remains missing and I, and others, would like to see that puzzle completed as much as possible. Restaurant owners certainly would love to know whose reviews led people to dine at their establishment. Personally, if one of my readers dines at a restaurant based on one of my reviews, and they enjoy their meal, I would appreciate a small favor in return. First, please tell the restaurant that you visited them based on my recommendation. Second, please tell me where you dined based on my review. That would be very useful to me and would be beneficial to the restaurants as well. I receive feedback from some of readers, and know at least some have let restaurants know they visited due to reading one of my reviews. I know that I am not alone, and that other writers and bloggers would love to hear more feedback on their reviews. So I encourage you to do a similar favor to them. If a review motivates you to visit a certain restaurant, then let that restaurant know which review led you there. Let your voice be heard, and it will cost you no more than a few moments of your time. Tell the restaurant who sent you. 1) The Automatic Food + Drink loves heat, spice, sweat and tears. So, of course The Automatic is hosting its own unique Cupid's Hell Night on February 14. With hot chili peppers as one of the most popular and powerful aphrodisiacs, what’s not to love at Cupid’s Hell Night at The Automatic? Plus, let’s be honest, it is a great excuse for Cousin Dave to dress up like Cupid. Two seatings, beginning at 6pm. Reservations highly recommended as The Automatic Hell Nights always sell out. To make a reservation, please call 617-714-5226. Make it a staycation by reserving a room at The Godfrey Hotel with their Love Takes Over package. Guests of the hotel on the 14th will receive double occupancy accommodations, a bottle of Veuve Cliquot champagne, beloved classic mouse chocolates from L.A. Burdick, overnight valet parking and a 2pm check-out. 4) Take that special someone out for an evening they will not forget. Chef Josue at Bistro du Midi has put together a special four course, multi-choice menu with optional wine pairings. You can enjoy dishes such as Chamomile Cured Scallop, Wagyu Beef Tartare, Seared Foie Gras, Duck Breast, Venison Loin, and Dulcey Ganache. The Valentine’s Day prix fixe menu is $105 per guest, with an optional $65 wine pairing. Both bars welcome walk-ins only, with a limited special Valentine’s Day Bar Menu. To make Reservations, please call 617-426-7878. 5) The team at Chopps American Bar and Grill invites guests to celebrate Valentine’s Day with a special Chef’s Tasting Menu, available Friday, February 9th-Saturday, February 17th. Executive Chef Steve Zimei has crafted an exclusive menu for lovebirds in addition to the a la carte menu items. The Boston Marriott Burlington invites guests to take the elevator home with a Romance Package. Treat your sweetheart to this special package featuring overnight accommodations for two, dinner, and breakfast at Chopps American Bar and Grill, and a $50 gift card to Longs Jewelers to pick up something special. Guests will receive a bottle of champagne hand-delivered to their room to sip and savor and toast to each other. 6) Celebrate with the one you love in Kendall Square this February 14 at Sulmona Restaurant + Bar. Chef Delio’s has crafted some exclusive menu additions full of amore. The Sulmona team is also featuring a special wine for the evening, the 2013 San Silvestro Barolo, which is available by the glass or bottle. To make Reservations, please call the restaurant at 617-714-4995. 1) Bar Boulud takes a modern approach to the classic Parisian patisserie experience with the debut of its new menu: “An Afternoon in Paris.” Whether gathering for business or pleasure, this experience features a selection of afternoon “perks,” including café, tea and rich house-made chocolat chaud, paired with an assortment of petite patisserie created by Pastry Chef Robert Differ. 2) On Sunday, January 7th, 2018, a pipe burst at United South End Settlements’ (USES) South End House, causing extensive damage to each floor and displacing over 100 children from early childhood education and after school programming. To this end, USES has created an emergency fund to support families with financial assistance, cover the costs associated with equipping a temporary space, and assist USES with expenses related to rehabbing our building that are not covered by insurance. USES has secured temporary space for programming, as demolishing and rebuilding the interior of the building is expected to take 12-18 weeks. “The biggest expense USES faces is repairing our roof. The pipe burst due to exposure to the frigid outside air. Insurance will not cover the repairs, yet this work is essential to preventing a future recurrence,” said Weir Lytle. The mission of United South End Settlements is to harness the power of the diverse community to disrupt the cycle of poverty for children and their families. In the South End, where USES is located, 36% of children live below the poverty line. Collectively, they have the capacity to do better for the children in their neighborhood, ensuring that both children and their parents develop the skills they need to succeed in school and in the workplace. 3) In celebration of National Hot Chocolate Day on January 31, the North End’s il Molo will show off and serve up their specialty hot chocolate recipe at no charge. Not your average hot cocoa with powdered ingredients, il Molo’s hot chocolate blends milk with melted, rich chunks of chocolate and is topped with whipped cream and chocolate shavings. For added warmth, order a spiked option with your favorite winter liqueur for a supplementary charge. 4) Chef Tony Maws is known for all things pork – especially his show-stopping Pig’s Head Platter served at Craigie On Main. Tony is offering Craigie’s Pig’s Head Platter, complete with all the fixin’s, as a Super Bowl Pigskin Take Out – so get your orders in early. This is a fingerlickin’ crowd pleasin’ platter of luscious pig’s head, ribs and/or sausage. Complete with all the fixin’s. *Full spice-crusted rack of heritage pork ribs / $25. 6 country pork sausages, sauerkraut and homemade mustards / $25. The Kirkland Tap & Trotter’s Green Chile Michelada Miz (8 ox of housemade fire-roasted green chile sauce and lime) / $8. Please note, several of these items in the Pigskin Package are not good for people with a peanut allergy. Also please note, you can order several racks of ribs, just please fill out separate tickets for additional orders. Please order by February 3 and pick up on February 4, fro 12pm-5pm. 5) Chef Tony Maws is pleased to host Boston Food Fight: February Fry-Off to benefit No Kid Hungry on February 10, from 1pm-3pm at The Kirkland Tap & Trotter. Tony has invited four guest chefs from top restaurants in the city to compete in this legendary Boston Food Fight. The four chefs will compete for votes in the ultimate battle for the perfect french fry! Admission includes all you can eat, as well as 2 sponsored drinks. Have you lost your sense of vinous wonder? After years of wine drinking, some people's palates become jaded and little excites them anymore. They also don't seek out different wines, electing to drink the same old wines all the time. Still other people become arrogant and pretentious, often primarily chasing after trophy wines, engaging in one-upmanship with their friends. They seek out high-end Bordeaux and Burgundy, California Cabernet and Italian Barolo, and similar such wines. Dining out with their friends becomes a competition, with each person seeking to select the best (and usually a pricey) wine on the list. All of these people see nothing wrong with their behavior, failing to realize they may have lost their sense of vinous wonder. There are other people, with the same amount of wine drinking experience, who haven't become jaded or pretentious, who still marvel at wines that aren't trophies, wines which may be inexpensive and more unusual. They get excited about rare grapes, unique wine-making styles, and less common wine regions. These individuals still appreciate and understand the allure of trophy wines, the expensive classics, but they don't make them their raison d'être. They find pleasure and wonder in a wide range of wines, of all price points, of all types, from all regions. It is usually easy to differentiate those who are jaded or pretentious from those who still possess that sense of wonder. Watch as they present a new wine, priced under $20, that excites them and you'll see a fire in their eyes and their words will be indicative of their delight. They will be eager to share that wine, to spread their thrill with their friends. The jaded person might share a similar wine, finding it of interest, but it's obvious they lack a true passion for the wine. It is offered more as intellectual experience, and it might even be compared to higher-end wines, noting its failings compared to those classics. And the pretentious ones might even show disdain for such an inexpensive wine. We should approach wine as a child approaches life, with an eager curiosity. Like children, we should embrace wonder and be open to new experiences. I want to spend time with those who still possess their sense of vinous wonder. I want to share wine with those people, to marvel together at the unique, inexpensive wines we find. We can still drink and enjoy high-end, classic wines too but we won't turn up our noses at other wines. We will cherish the diversity of wine, being adventurous and exploring all that exists. Try to examine your own approach to wine with a critical eye, to determine whether you still possess that wonder or not. If you do, then I strongly advise you to be wary of becoming jaded or pretentious. If you do not, then I highly recommend you make changes to your vinous life. It's never too late to change. If you refuse to change, then you'll lose out on so much. 1) Chef/Owner Delio Susi and his team at Sulmona Restaurant + Bar are introducing an Abruzzese tradition for their guests with the debut of Polenta Parties all this February (except February 14), during dinner service which starts at 5:30pm. Chef Delio and his team have put together this special menu that is inspired by his family’s recipes and the way that they enjoy polenta at his Aunt Maria’s. Pricing for the Polenta Party menu ranges from $18 - $32/person depending on selected toppings. The experience is available for parties of any size, from the solo diner to sharing with a group with the communal Farmer’s Table at Sulmona available for up to twelve guests. For something special to sip alongside these selections, guests can indulge in the Pia, a cocktail hand-crafted by General Manager Carmelo Bari and Sulmona’s bar team to accompany the Polenta Menu. Served in a polenta and sugar-rimmed coupe glass, the drink combines Grey Goose Pear Vodka, muddled sage simple syrup, Cynar (artichoke liquor), lime juice, and blood orange. Finish the night off with a polenta-inspired dessert. Sulmona’s Pear, Vanilla, and Amoretti Tart, made with thyme and sweet polenta crust and topped with almond gelato. 2) The North End’s il Molo is gearing up once again for a Patriots post-season to remember with a special dollar menu. Head to il Molo for Sunday afternoon’s AFC Championship matchup against the Jaguars and nosh on a new $1 Game Time menu featuring finger foods such as Grilled Italian Sausages (topped with perfectly charred caramelized onions and pepper rings), Crispy Shrimp Tacos (topped with spicy aioli sauce and pickled red onion), Fried Calamari (served with sweet dipping sauce) and fresh Oysters – all for a buck. Complimentary, freshly popped Parmigiano Popcorn will also be available at the bar throughout the game. il Molo’s 60-inch flat screen TV hanging above the bar provides sight lines from almost anywhere in the bar-area, and an extensive list of beer, wine and cocktails completes the intimate game-watching experience. The Game Time Menu is available, starting at noon, with the purchase of any beverage and is offered at the bar and at high-top tables in bar-area only. 3) Puritan & Co. Chef/Owner Will Gilson, Wine Director Peter Nelson, and the Puritan & Co. team invite guests to join them in celebrating their fifth anniversary with a special "greatest hits" dinner. Puritan & Co. will be hosting a multi-course "throwback Thursday" dinner featuring its greatest hits over the past five years on Thursday, January 25th, at 7pm. Tickets cost $125 and include wine pairings. Please call 617-615-6195 to make reservations. 4) On Saturday, January 28th, from 12pm-2pm, Loretta's Last Call will be challenging teams from eight different bars to throw-down in an epic Bloody Mary battle-Tito's Battle of the Bloody, to decide Boston's Best Bloody. Kicking off at noon, guests will sample each team's bloody and award the winner "best bloody" bragging rights and a $250 cash prize. Tickets cost $16 each and include eight mini Bloody Mary's, brunch snacks, live music, and one ticket for a gift card/Bloody Mary raffle. Half of all ticket proceeds will be donated, and matched by Tito's Vodka, to Cradles & Crayons mission to provide children from birth through age 12, living in homeless or low-income situations, with the essential items they need to thrive. Today is Martin Luther King, Jr. Day, a federal holiday that commemorates the birthday of this civil rights hero. In this single post, I can't do justice to the vast work of Dr. King but want to at least write something which attempts to epitomize the spirit of Dr. King. And of course, I want to tie it into the world of food and drink. The above quote is pertinent in many ways, in many different realms and industries. It encourages us to reach out and converse with others, to learn more about each other so we fail to fear others out of our ignorance. In the Boston+ area, food & drink writers need to embrace more diversity, to reach out and connect with others who are different from them. We need to have more communication with others, to expand our circles so that we can understand others better. We have to break down the artificial barriers that separate us, which can be taken down so easily if only we want them to vanish. And we have to work together to take down other barriers which are more real and not as easily vanquished. Rather than fear and ignorance, we need to be more welcoming and knowledgeable. We need to offer each other assistance, to help us all grow in various ways. For example, though there are hundreds of food & drink bloggers in the Boston+ area, the number which are written by people of color is extremely low. I've previously highlighted some of those writers, which unfortunately is a very short list, though I'm also sure that my list isn't complete. I've also previously written about my disappointment at the lack of diversity in numerous food and drink events I've attended over the years. Obviously people of color love food & drink just as much as anyone else so how do we encourage more of them to blog and attend local events? One way to do so is for us to communicate more with others, to open ourselves to people who are different from us. We should actively seek new experiences and provide support, assistance and mentoring to others who are open to it. As another example, food and drink writers need to seek out more diversity in the subjects they wrote about, to break out of their comfort zones and communicate with others who are different from them. Interview, highlight and feature more people of color who are chefs, cooks, restaurant owners, wine makers, winery owners, etc. Maybe you feel uncomfortable talking with these people, or visiting their places, but you need to get over it, and just do it. Confront your fears and you'll find there was no reason for fear in the first place. Visit some parts of Boston you don't normally visit, which might be places such as Roxbury and Dorchester, and check out the culinary wonders going on in those areas. Break out of your circles of comfort and reach out to people outside those circles. Push aside your fears and misconceptions and get a first hand experience with others. We all can do our part to unify rather than divided, and the first step is communication, just talking with others, learning about their experiences and points of view. It's all very simple and the benefits can be enormous. 1) This is an exciting event, bringing a taste of Peru to Cambridge! I've long said we need more Peruvian cuisine in our local area so I hope this event does very well. And how often do you find Guinea Pig on the menu? The Automatic Food & Drink is letting Chef Martin Su, who is a native of Peru, take over the kitchen on Sunday, January 28, for a special Peruvian Takeover. Chef Martin will highlight some of his favorite and authentic dishes from Peru. All items to be ordered a la carte, and pricing is still To Be Determined. 2) For National Hot Toddy Day, which is today, January 11, Sumiao Hunan Kitchen is offering their own version of a Hot Toddy ($7), with a base of a "warm lemon-honey black tea that is enriched by the depth of Courvoisier VSOP Cognac, a spirit that captures the earthy essence of autumn in New England. A house made lavender-clove reduction is folded in and the cocktail is finished with a sweet dose of Disaronno Amaretto and garnished with a lemon twist." With the cold temperatures we've been facing, a Hot Toddy will hit the spot, and warm you up. 3) The new Eventide Fenway is now offering rotating brunch-specific specials mid-day on Sundays, from 11am-3pm, alongside their regular menu. Start the day off right with Buns and Bubbles – two signature Chinese steamed buns filled with soft scrambled eggs, topped with dollops of caviar and served alongside the classic morning OJ and bubbles mimosa – or a Pork Roll Breakfast Sandwich – New Jersey’s beloved breakfast meat with eggs and cheese on an everything bagel. The Craigie Vegetable Burger is made with roasted black beans, brown rice and lentils as the base. Maws adds to it a special blend of fire roasted mushrooms, tahini, fermented black bean powder, miso powder and a kick of pomegranate molasses. Egg serves as the binding agent to keep it all together. “The taste and texture are both so important” shares Maws. “This has to taste really really good. I didn’t want to create a vegetable burger just so I could have one on the menu. My purpose is to create a really juicy and delicious vegetable burger that holds its own on the plate and on our menu.” Maws serves the Craigie Vegetable Burger on a home-made bun, and is tinkering with the condiments. To a carnivore like me, can any veggie burger really stand up to a beef burger? Maybe I will have to check it out and see. 5) The North End’s il Molo is gearing up for a Patriots post-season to remember with a special dollar menu. Head to il Molo for Saturday night’s matchup against the Titans, from 4pm-11pm, and nosh on a new $1 Game Time menu featuring finger foods such as Grilled Italian Sausages (topped with perfectly charred caramelized onions and pepper rings), Crispy Shrimp Tacos (topped with spicy aioli sauce and pickled red onion), Fried Calamari (served with sweet dipping sauce) and fresh Oysters – all for a buck. Complimentary, freshly popped Parmigiano Popcorn will also be available at the bar throughout the game. il Molo’s 54-inch flat screen TV hanging above the bar provides sight lines from almost anywhere in the bar-area, and an extensive list of beer, wine and cocktails completes the intimate game-watching experience. The Game Time Menu is available with the purchase of any beverage and is offered at the bar and at high-top tables in bar-area only. 6) David Vargas, chef/owner of Vida Cantina and business partner Joel Harris, owner of Dos Amigos, announce the formation of Vida Tortilla, an exciting new collaboration bringing together a local chef, local farm, and local business to create a new local product: fresh organic tortillas. Vida Tortilla’s one-of-a-kind tortillas will be made with Tuckaway Farm’s organic heirloom flint corn using local expertise and labor. Vida Tortilla’s fresh organic tortillas will be featured at Vida Cantina in Portsmouth, as well as at the very popular Dos Amigos’ 4 locations, farmers markets and local specialty stores. Vida Tortilla plans to be preparing and selling fresh NH grown, NH made tortillas in Spring 2018. The team has just launched a Kickstarter campaign, with a goal of $11, 500, to raise funds for securing a business loan to help pay for the purchase of a custom-made tortilla machine and the build-out of a new kitchen in Dover, NH. The Kickstarter campaign runs through January 22, 2018 and Backer rewards include cooking classes, taco parties, and a fiesta catered by Dos Amigos and Vida Cantina. Their Kickstarter campaign has nearly reached its goal and just needs a little push to get them over the goal line. You can join the campaign directly through Kickstarter or you can attend a special fund raising event, Vida Tortilla Night, which will be held at Vida Cantina on Thursday, January 18. A Four-Course Menu will be offered for only $25, and a portion of the proceeds will go toward the Kickstarter. The Menu includes Seasonal Salsa, Flint Corn Encrusted Haddock Taco, OG Chicken Pie, and Mango Stone Fruit Galette. This sounds like a cool Kickstarter, and they are close to meeting their goal. Why not help them make their dream a reality? 1) Did you know Sparkling Sake exists? A recent Japan Times news article discusses the growing popularity of Sparkling Sake, from its origins in 1998, noting "Presented in small, stylish bottles, many kinds of sparkling sake are only about 5 percent alcohol - lower than the 15 percent of typical sake. It is a popular choice among women." At most of the Sake tastings I have held, Sparkling Sake has usually been the most popular choice of the women attending the tasting. A few brewers have also started producing Sparkling Sake that is more similar to Champagne. Sparkling Sake can be a introduction to Sake, showcasing its diversity and breaking misconceptions about the nature of Sake. The next time you want to celebrate with some bubbly, consider Sparkling Sake. 2) Should you age Sake in oak barrels? Very little Sake is aged in wood, and most that is aged in such a manner is aged in Japanese cedar and known as Taruzake. This has historical precedent but what about oak aging, like with wine? The Japan Times wrote about Wakaze, Inc. is now exporting its Orbia Sake brand, which has been aged in used oak barrels. One variety, the Sol, is aged in former red wine barrels while the Luna is aged in former white wine barrels. The Sol is "known for its rich sourness and fruity aroma" while the Luna is known "for its delicate sweetness." A major reason for the creation of these Sakes is to make them better pairings for Western cuisine, such as meat dishes or other fatty foods. This is an intriguing idea though I could see the oak barrels overwhelming more subtle Sakes. 3) Huge Sake news from New York! The Nikkei Asian Review is reporting that the Asahi Sake Brewery, which produces the famous Dassai brand, is planning to open a large Sake brewery in New York state. They have purchased a 62,000-sq.-meter site in New York's Hyde Park area, located in the Hudson Valley, in partnership with the Culinary Institute of America, and the total investment is estimated to be about $31 Million. Plans indicate the brewery will be about to produce about 1.8 million liters, and primarily Junmai Daiginjo, using locally grown rice. They hope to price this Sake at an extremely inexpensive $15, when most other Daiginjo Sake costs $40+. This is certainly indicative of the huge Sake market in the U.S. and could help promote Sake in a large way, especially considering its low price. It will likely be a couple years before we start seeing Sake from this planned brewery but it's very exciting news. And maybe other Japanese Sake breweries will now consider opening a brewery in the U.S.
Last week, there was a significant snowstorm in the Boston area, leaving over a foot of snow in some places and causing some coastal flooding. Driving was treacherous, some roads needed to be shut down, and you needed a boat to navigate some roads. Many people chose to remain inside rather than attempt to travel, canceling their scheduled plans. And this situation leads me to provide some advice I've given before, to remind people who might have forgotten. A number of restaurants, which remained open despite the snow, ran special offers, trying to entice diners. Snowstorms can wreck havoc with a restaurant's bottomline, especially when you consider that January and February can usually be slow times. After the holidays, people often tighten their economic belts and don't dine out as much, trying to pay off any bills incurred during the holidays. 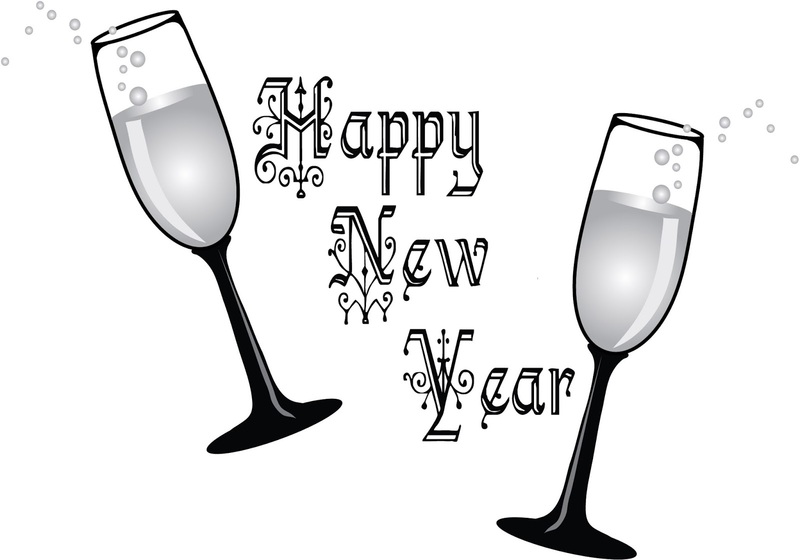 Others make resolutions, starting diets and try to eat more at home. Thus, at this time, restaurants need as much business as they can get, and a snowstorm can throw a wrench into those plans. When a restaurant loses business due to a snowstorm, they lose money and it is not always easy to make up for that loss. Some restaurants run "blizzard" or "snowstorm" specials, attempting to lure in some customers. Even after a major snow event, some potential customers will prefer to remain home rather that attempt to battling snow covered roads and limited parking. Restaurants may continue to lose business for a few days after a major snowstorm. This will put stress on even the best of restaurants, so something needs to be done to help them. My advice is simple: Dine out more this winter. Despite the snow, despite the obstacles, people need to patronize more restaurants at this time, giving them your support and money. Don't go out if it is dangerous to do so, but don't stay in just because it is only inconvenient. If you can, walk to nearby restaurants. If possible, drive a short distance to other restaurants. Take public transportation if possible. Order takeout or get delivery. In New England, we are used to snow so it shouldn't be as much of a barrier as it might be elsewhere. And during this winter, when there isn't any snow, dine out more, giving your business to these restaurants to help them survive this season. Dine out more this winter. Give restaurants your support during these difficult times. Don't let snow lock you into your house for days on end. 1) For the first time, Legal Harborside’s scenic second level dining room will offer a regular weekday lunch service from 12:00pm-3:00pm while overlooking Boston Harbor. Last month, Legal Harborside opened their second level for midday dining to accommodate the bustling holiday season and given the popularity of the service, it will become a permanent fixture in the New Year. Legal Sea Foods’ flagship location in the Seaport will offer an upscale lunch experience on their second level with a menu comprised of chilled shellfish, crudos, soups, salads, appetizers, sandwiches and entrees. Highlights from the menu include Jonah Crab Toast with fennel fronds, jalapeño and lemon aioli ($15); Legal’s Signature Crab Cake with jumbo lump crab, remoulade sauce and seasonal salad ($17); a Lobster Roll, prepared traditionally with mayo (MP); a Salmon Burger with freshly ground salmon and roasted red pepper sauce ($14); and, Grilled Tuna with cous cous and butternut squash ($MP). 2) Sumiao Hunan Kitchen is welcoming the New Year with the start of new traditions in Cambridge’s Kendall Square. Designed to heat up the frigid winter, Sumiao Hunan Kitchen is serving up a collection of spice-packed specials and after-dinner drinks to warm the soul. Available throughout the month, Sumiao Hunan Kitchen’s chef specials include the 2017 Fish Platter – a popular menu feature from their New Year’s Eve special – with red braised whole tilapia flavored with a black bean chili sauce and garnished with ginger, scallions and green & red peppers ($38) and the Furious Frog, a daring twist on their signature “Angry Frog” creation that brings even more Hunanese heat to a mix of bullfrog, duojiao, pickled red pepper, garlic and scallions ($32). Debuting at the end of the month and available through the spring, the 2018 Delight is a bowl packed with all of SHK’s favorite things: egg-wrapped fish paste, meatballs, bamboo shoots, calamari, pork, sea cucumber and more ($48). If you are resolving to cut dessert from your diet in 2018, Sumiao Hunan Kitchen now will offer a dedicated “Digestif Spirits” menu. Comprised of single malt scotches, cognacs, cordials and after-dinner cocktails, the new menu is the ultimate perfect ending to any meal without all of the guilt. Highlights include a Macallan 18 Year ($26), Balvenie 14 Year ($20) and Glenlivet 12 Year ($15); D’ussé VSOP ($17) and Courvoisier XO ($25); Fernet Branca ($10) and Godiva ($10); and, a Chocolate-Hazelnut Martini ($10). 3) Thursday, January 11th is National Hot Toddy Day and the Seaport Hotel’s TAMO Bistro + Bar is a fine place to celebrate. 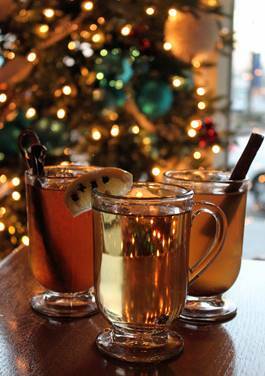 Escape the frost and cozy up by the fire to enjoy a piping hot toddy, made with whiskey and customized to your liking. Choose from Traditional (Seaport honey, lemon cloves), Spicy (Sriracha-infused Seaport honey, dried pepper) or Sweet (cinnamon-infused Seaport honey, cinnamon stick) variations to satisfy your taste and warm up from the inside out this winter season. Each Toddy is $12. As 2018 has now arrived, you'll here plenty of predictions for this New Year, but not from me. We can all hope that 2018 will usher in positive changes to the local food & drink industry. Instead of offering any predictions, I'm going to provide a list of my desires, those trends, issues and items which I would love to see step forward and take precedence in 2018, though I'm not predicting they will actually come to fruition. However, I think we would all benefit if these desires were fulfilled. Many of these desires are the similar to those I wrote in previous years as those desires did not come to fruition but I still believe they should become more prominent. Maybe 2018 will finally be the year to see at least a couple of my desires come true. A breakfast pizza, such as with potatoes, bacon, cheese and a fried egg, can be absolutely delicious. It isn't a difficult dish to create yet you won't find it available on many menus. Think of all the pizza joints you know and then consider which ones make a breakfast pizza. You might know one or two, at best. So why isn't it more popular and available? It is puzzling to me and it seems such a no-brainer. People love pizza so why wouldn't they also love a breakfast pizza? This too seems to be a missed opportunity for many so I hope more restaurants decide to add these to their menu. In the Boston area, Sake is largely confined to Asian restaurants and there is no reason why that should be the case. Sake pairs well with all sorts of cuisines, from Italian to French, Barbecue to Burgers. I've previously written about The Science of Sake & Food Pairings, explaining reasons why it pairs so well with varied cuisines. For Sake to become more popular and mainstream, we need more restaurants to carry and promote Sake. Tasting Counter is one of the courageous outliers, a non-Asian restaurant with ten Sakes on their menu. In southern Maine, plenty of non-Asian restaurants now carry the locally made Blue Current Sake. There is now Dovetail Sake, made in Waltham, so Boston restaurants have another local option to add to their drink lists. Sake is not just for Sushi! Why do so many Asian restaurants have to offer multiple cuisines, providing Chinese, Japanese, Thai and Korean options on their menus? Why does a Japanese restaurant have to offer every type of Japanese food that exists? I want to see more specialized restaurants, those which concentrate on a very limited menu, and which can excel with those dishes. In Japan, you'll find thousands of specialized restaurants yet it is far more difficult to find such places in the Boston area. Yume Wo Katare and Yume Ga Arukara are excellent local examples of specialized spots and should be a model for other restaurant owners. This all applies to other cuisines too. For example, Italian restaurants don't need to have a burger on their menu, and also don't need to cover every regional Italian cuisine. Throw out those huge menus and simplify. What food & drink trends would you like to see in 2018? 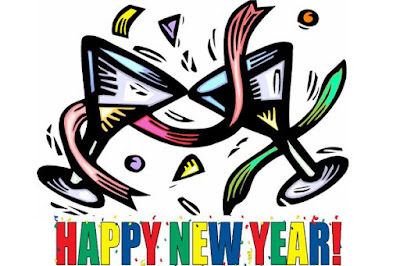 Happy New Year's and I hoped you enjoyed your celebrations last night, whether you were partying in Times Square or enjoyed a relatively quiet night at home. I hope you spent the evening with family and/or friends and drank some type of delicious Sparkling Wine. It is my fervent wish that this New Year is better for you than 2017.